Model T Ford Forum: Old Photo, Form-a-trucks? Model T Ford Forum: Forum 2013: Old Photo, Form-a-trucks? As always -- a higher resolution photo would make this a lot easier, but sometimes we have the best copy we can reasonably obtain. First -- they are not the Ford Ton Trucks. I.e. you can see the original car cast running board brackets and the TT used pressed steel running board brackets much closer together for the short TT running board. 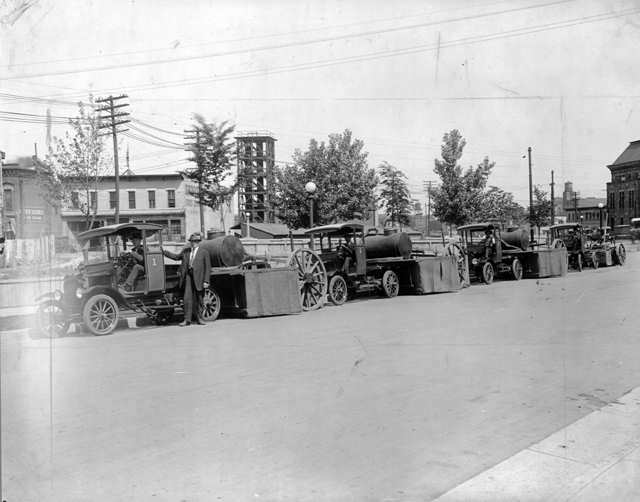 From the photo I cannot tell, but I would suspect they are 1917 chassis as the TT was introduced in 1918 (technically also a very few 1917s) and at that point the "form a truck" conversion of newer chassis would start falling off. Again, a higher resolution photo might allow us to see if the wishbone was above or below the front axle. While we cannot clearly see the chain drive, we know from other photos where it would be located and we can see the original T rear hub caps and from that locate the sprockets. 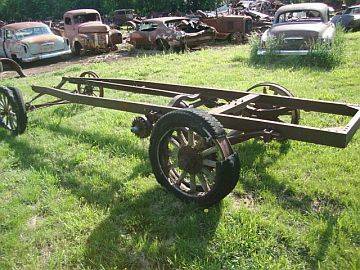 Several companies offered the chain drive conversions for the car T chassis to a ton truck. The Smith Form a Truck was one of the most popular (or at least the one I have seen the most). It used squared shaped spokes on the rear wheels. Again, with that resolution photo I cannot really tell if they are rounded or square spokes. The Wright version appears to have used rounded spokes. 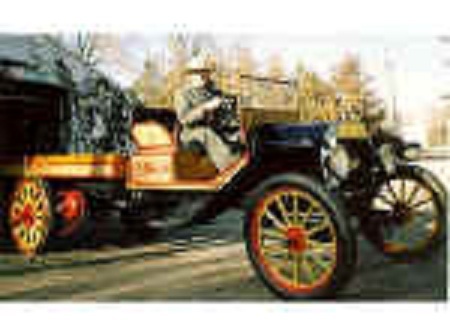 The photo below is from the Model T Haven web site when they had a Wright conversion for sale. And of course either company may have offered different style spokes at different times. I wish I had a bigger version of that image. Thank you Hap for your knowledgeable response. It is a charming picture just the way it is. I have a picture of a form a truck that was for sale in Fleming Colorado for many years. It had a 13 motor beside it that the owner said came out of it and a later motor installed. It eventually went to Sterling Colorado and was running. The fellow that bought it had to go to arrest home in Denver, Colorado. I lost track of the truck after that. The fellow that bought it said he had a lot of trouble keeping the chains in line. I will try to post a picture of it, but I have a lot of trouble posting pictures. All I get is an Error message. I have a picture of a form a truck that was for sale in Fleming Colorado for many years. It had a 13 motor beside it that the owner said came out of it and a later motor installed. It eventually went to Sterling Colorado and was running. The fellow that bought it had to go to arrest home in Denver, Colorado. I lost track of the truck after that. The fellow that bought it said he had a lot of trouble keeping the chains in line. I will try to post a picture of it, but I have a lot of trouble posting pictures. All I get is FILE LOCKING ERROR MESSAGE.